The siege of Eastern Ghouta’s civilian population began in 2013 and tightened significantly in 2017, with multiple deaths of malnourished children and deaths of adults and children who were denied medical evacuation by the Assad regime. As the Assad regime’s advance into Idlib halted along Astana-negotiated lines in mid February 2018, the regime redeployed forces to Eastern Ghouta in preparation for a major assault. That assault began with an escalation in air attacks across the besieged communities of Eastern Ghouta, home to some 400,000 civilians. From 18 February up to 23 March, the Violations Documentation Centre in Syria counted 2,002 confirmed violent deaths, over 90% of them civilians. At least 279 of those killed were children. 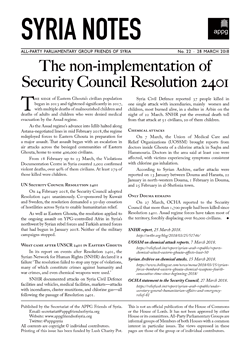 On 24 February 2018, the Security Council adopted Resolution 2401 unanimously. Co-sponsored by Kuwait and Sweden, the resolution demanded a 30-day cessation of hostilities across Syria to enable humanitarian relief. As well as Eastern Ghouta, the resolution applied to the ongoing assault on YPG-controlled Afrin in Syria’s northwest by Syrian rebel forces and Turkish armed forces that had begun in January 2018. Neither of the military campaigns stopped. SNHR documented attacks on Syria Civil Defence facilities and vehicles, medical facilities, markets—attacks with incendiares, cluster munitions, and chlorine gas—all following the passage of Resolution 2401. Syria Civil Defence reported 37 people killed in one single attack with incendiaries, mainly women and children, most burned alive, in a shelter in Arbin on the night of 22 March. SNHR put the eventual death toll from that attack at 51 civilians, 20 of them children. On 7 March, the Union of Medical Care and Relief Organizations (UOSSM) brought reports from doctors inside Ghouta of a chlorine attack in Saqba and Hammouria. Doctors in the area said at least 100 were affected, with victims experiencing symptoms consistent with chlorine gas inhalation. According to Syrian Archive, earlier attacks were reported on 13 January between Douma and Harasta, 22 January in north-western Douma, 1 February in Douma, and 25 February in al-Shefonia town. On 27 March, OCHA reported to the Security Council that more than 1,700 people had been killed since Resolution 2401. Assad regime forces have taken most of the territory, forcibly displacing over 80,000 civilians.